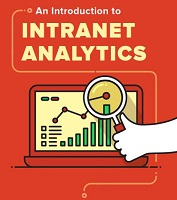 The Intlock team is happy to announce the release of their new eBook: An Introduction to Intranet Analytics. CardioLog Analytics is happy to announce the release of the new eBook: An Introduction to Intranet Analytics. The eBook serves as a resource for Intranet administrators and decision makers, guiding them in their analytics journey. Readers can discover which metrics they can begin using immediately to analyze, engage, and enhance their intranet portal. To download the ebook click here. Intlock was founded in 2005. Ever since, it has been a leader in analytical solutions for SharePoint Intranets and Internet websites. As the company's flagship product, CardioLog Analytics set Intlock apart and put it ahead of the competition. CardioLog provides organizations with insights on how their SharePoint portal is being used, and helps optimize the portal. As organizations started to expand, so did the use of SharePoint to public facing websites. A demand grew for marketing tools designed for SharePoint, which lead to the release of the SharePoint Marketing Suite, which includes a wide range of marketing solutions for enterprise-level websites. Today, Intlock products support all of the SharePoint versions, including the new 2013 edition. They offer a variety of insightful features and tools to help optimize portal and site productivity, as well as maximize the ROI. Intlock, based in Boston, Massachusetts, has offices and partners throughout the world. Some of the customers utilizing these products are large worldwide enterprises such as Applied Materials, Fidelity Investments, and US Department of State. Intlock also offers a variety of packages for small business and NGO’s. For more information about this topic, please contact James Wright at +1-617-500-8461 (US) or email info(at)intlock(dot)com or james(dot)wright(at)intlock(dot)com.